Bottom placed Tokushima were today on the receiving end of an S-Pulse side getting into its stride. Saved penalty aside, 4-0 probably flattered the home side. Nova came within the bar's width of getting his hat trick before the half time whistle even blew, and went close again in the second half. I'm not complaining, though. Today we played some wonderful stuff, on occasion taking our foot off the pedal, but seeing the job through. In the process we clawed our goal difference back into the positive. P8 W0 D0 L8, it's going to be a long season for Tokushima and anything other than a return to J2 will be a surprise. Their frustrations were evident as they played a physical game, but rarely, if ever, really troubled Kushibiki. Speaking of which, this game marks our 4th shut out victory in a row. Top marks to all, but especially young keeper Masatoshi Kushibiki. His penalty stop was pretty special. Weak opposition, but a professional job done and potential banana skin successfully sidestepped. Genki was once again instrumental, playing roles in the first three goals before topping off his day with a sublime swivel and finish while under pressure. Nagasawa went off at half time with a knock, and we'll know more tomorrow on his status. Hopefully nothing serious and he's back on Saturday for the home game with 17th placed Sendai. See you there! Watched S-Pulse-Vegalta this morning, Murata is like a rocket, you can't stop him when he is launched ! That's four years of meaning to get round to it. Having followed the Mighty 'Pulse since 2004 and experienced enough highs, lows and last minute penalty misses to last a lifetime, it's high time we started documenting our adventures. Join us as we travel the length and breadth of Japan, seeing the sights, drinking the ales, befriending the locals, and occasionally even taking in 90 minutes here and there. 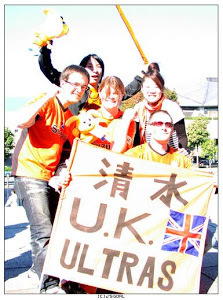 Originally consisting of one loan member sitting through a home defeat in a typhoon (without the luxury of a roof), the UK Ultras are now a fluid group of 20+ S-Pulse fans from around the world - including several Japanese! The only continent not yet represented is Africa. Above and beyond acting as a scrapbook for our own varied misadventures, this fanzine's goal is to provide news and information to the English speaking world about a truly unique football club, and to help build and broaden S-Pulse's profile on the world stage. With thousands of visits here from all four corners of the planet, the world is clearly hungry to learn about S-Pulse, and we're happy to help spread the word. Being a football fan has never just been about what happens on the pitch, and this fanzine is here to document all the fun and games that go along with following S-Pulse. We'll sometimes report on news other than S-Pulse which rattles our cage, but we're experts on nothing other than our own opinion, so don't take anything we say too seriously. Match reports being a good example. Wildly biased and put together on memory (it's not easy taking notes while dancing the samba), they may occasionally be lacking in analytical depth. Other than that, just enjoy one of the wildest rides in the J. 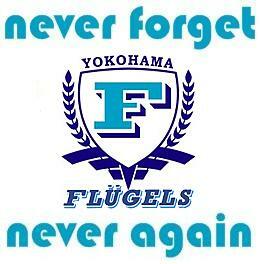 League - Shimizu S-Pulse! 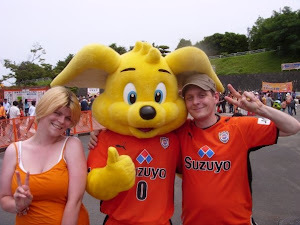 Barry: Lives in Shizuoka. His first game was home to Urawa in March 2004 which S-Pa won 4-3. Having set up this fanzine back in April 2008 it's since taken on a life and a momentum of it's own. It's not easy to always find the time to keep the site updated, but seeing how many hits we get from around the world, the effort is worth it. When not bouncing around behind the goal at Nihondaira, he expends his remaining football energy on the glorious Brighton and Hove Albion. Lives in Osaka now but her heart is still in Shimizu. Mother to one cheeky wee girl she lives in hope of getting to more games these days. When she's not rooting for the 'Pulse, Fuz spends her footie time following the mighty Glasgow Rangers.